It's not just you. I've been doing it too. Although I think even the LEGO Movie series had some really good stuff--not so many must-have characters, but lots of must-have parts like the coonskin cap (Wiley Fusebot) and the long, ratty gray hair (Mrs. Scratchen-Post). Definitely an awesome series. I particularly like the goblin. Is it just me, or does the king look like he should be selling fast food? Yes! And that is awesome! The word you're looking for is shaffron or champron. There are various other spellings and pronunciations. Karalora wrote: I always wondered why they were called mind-flayers when what they eat is your physical, meaty brain. Not that D&D doesn't have its share of beasties that really do eat your mind in a metaphysical sense, like that ghost-platypus thing. Someone on another forum suggested using the S13 alien head by itself as a creature which is an interesting idea. Definitely an awesome series. I particularly like the goblin. I do, too. All the castle/fantasy minifigures in this series are cool, even the female cyclops which has been much derided. 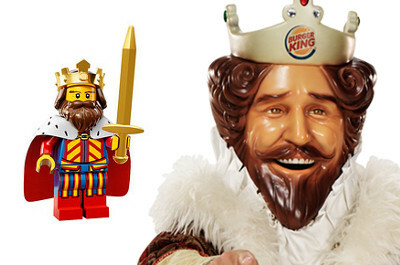 Bruce N H wrote: Is it just me, or does the king look like he should be selling fast food? It's not just you. I feel the need to create a MOC of that king with a cleaver and a frying pan chasing a horse. Don't you just love it when you think you're eating beef but in fact have been duped into eating horse? I like this series but...um...don't they look a little "cartoonish" to you? Less like a traditional minifig and more cartoony. Looking at the cyclops, all I can think is why does it have a pink mustache? A lot of good figures here, to be be sure. Likes: hot dog suit guy. I'm not usually much interested in the "x suit guy" group of figs, but between hot dog suit guy and the King rocking the BK look, I kinda want to build me a fast food restaurant. Although there is a good group of figs here, most of them are not ones I want large numbers of (exceptions including goblin and Egyptian soldier). For example, anyone who's been collecting for even a few years is probably facing the problem of excessive royalty--that is, what to do with all the kings? I like to have a vague story universe behind my fig collection, and over the years some of my kings (especially those from KK1 and royal knights) have had to be ret-conned into knights or more generic soldiers. I've also toyed around with the idea of having high kings, overkings, or emperors to which the various subkings report. So while I probably will want one king figure, I doubt I'll want more than that. Zurem wrote: It's my belief that it could easily pass as a mindflayer, which is a kind of squid monster seen in dungeons and dragons; the green color is kind of weird, but that gives it more creepy-factor. What do you reckon? Does it fill the niche? I'm always a fan of the collectible Minifigs. Although I do not try to collect all the figs from each series anymore, I see about 6-7 that I will be getting at least one each of from series 13. Having the goblin 5 per box is the best thing lego has ever done. Going to be adding a lot more MOC peasants to my village. Have to admit that the king is my favourite of the new series. Even though he looks like he should be on a playing card.